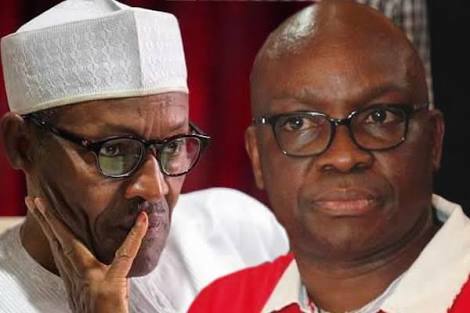 Ekiti State Governor, Ayodele Fayose, has said he stands by all he said about President Muhammadu Buhari on his ill health and has no apologies. The Chairman of the Peoples Democratic Party’s Governors Forum advised the president to resign so as to look after his health because he is sick and tired. Fayose spoke on Wednesday during a meeting with political office holders at the Government’s House in Ado Ekiti. He said, “If not for our efforts, Buhari wouldn’t have returned now. Buhari is sick and tired and even his physical appearance betrayed this and he needs to go home and rest. Fayose, however, denied reports on social media that he vowed to commit suicide if the president came back alive from his medical vacation to the United Kingdom. He attributed the rumour to the work of miscreants spreading misleading reports about him in the social media. Fayose said pressure from him and civil society groups, including ‘Resume or Resign Movement’, was responsible for the forced return of the president to Nigeria. “The pressure from me and many other Nigerians made the president return home. They have been treating this matter under the table forgetting that the life of a president is an open book that can be read by everybody and anybody. “Not until civil societies and people like us started making noise. You can’t be our president without us knowing what is happening to you. “For me, the president went to a coma on July 6. Today, they can come back and organise rallies and all that attested to the fact that the President recovered by a miracle which we are glad about. “We are happy that he is back. But when you look at the President physically, you will see that he is emaciated, tired and weak. You don’t have to be president at all cost when you are tired, you go home. “I stand by all I have said about the President. We are glad he is back but don’t over-flog him. I am not a sycophant and I stand to speak for Nigeria. Somebody must be able to speak on behalf of the poor masses. This was how they deceived us during the time of Yar’Adua. The governor also took a swipe at those saying Buhari was old enough to be his father. Asked if he would honour the invitation if invited to see the president, the governor said that could be misinterpreted, adding that he would prefer to watch from a distance. “I don’t want to talk about 2019′, but I want to tell you that Nigeria needs a president that is agile and strong. The job is too much for an individual that does not have what it takes. “We wish him well and we want him to recover but the President should throw in the towel, resign and go home.